Ornithologist, conservationist, and naturalist Bruce Beehler has spent much of his scientific career studying and working to conserve birds and their habitats. 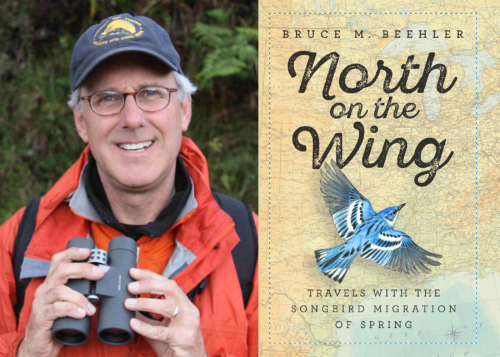 In his new book, North on the Wing—Travels with the Songbird Migration of Spring, Dr. Beehler recounts his hundred-day-long field trip in 2015 following the spring migration of songbirds from the coast of southeastern Texas up the Mississippi and into the boreal forests of northern Ontario. Part travelogue, part field journal, and part environmental and cultural history, North on the Wing is a fascinating first-hand account of a once-in-a-lifetime journey. It engages readers in the wonders of spring migration and serves as a call for the need to conserve, restore, and expand bird habitats to preserve them for future generations of both birds and humans. Dr. Beehler currently serves as a Research Associate in the Division of Birds at the National Museum of Natural History, Smithsonian Institution, and conducts research and writing about nature and natural history. Beehler holds degrees from Williams College and Princeton. After conducting doctoral fieldwork in Papua New Guinea, he worked for ten years at the Smithsonian’s National Museum of Natural History, followed by stints at the Wildlife Conservation Society, U.S. Department of State, Counterpart International, Conservation International, and the National Fish & Wildlife Foundation. In 2007, Beehler was featured in a 60-Minutes piece highlighting an expedition he led to the Foja Mountains in the interior of New Guinea in which scores of new species of plants and animals were discovered. He received the Bicentennial Medal from Williams College in 2016 for his conservation work in the Pacific. The following year, Beehler received the Scientific Achievement Award from the National Museum of Natural History. He has published thirteen books and authored more than a hundred technical and popular articles about birds and nature. Beehler is an elective Fellow of the American Ornithologists Union, and has served on the boards of the American Bird Conservancy (ABC), RARE, and the Livingston-Ripley Waterfowl Conservancy. Currently, Beehler serves on the Scientific Advisory Board of the Rainforest Trust and is a Research Associate of the American Bird Conservancy. We are proud to host Dr. Beehler as this year’s Sessions Speaker at our 72nd Winter Banquet Fundraiser at Protective Life Corporation (2801 Highway 280 South). Join us in Protective’s Grand Bay Conference Room on Thursday, December 6th, for a social hour and book signing at 5:30 p.m., dinner at 6:30, and Dr. Beehler’s keynote address at 7:15. Tickets are $75, payable at the registration link below. (The price covers the meal, $50, as well as a $25 contribution.) Space is limited—don’t miss your chance to attend this special event. We’ll have both vegan and gluten-free options for this year’s event. If you have any food restrictions, please email the Outreach & Communications Director. Birmingham Audubon’s Winter Banquet is made possible through the support of Protective Life Corporation. Find out more about Protective and its services at www.protective.com.